This is the ninth anniversary of the first post on my blog, and every year at this time I take a moment to reflect on what’s happened in the last twelve months in my professional life and in the world of Microsoft BI. Without a doubt 2013 has been the year of Power BI. It’s true we’ve had PowerPivot Power Pivot for a while now, but in my opinion the combination of Excel 2013, Power Query, Power Map, Power BI Sites and Q&A is a much stronger proposition for customers interested in self-service BI; I’ve already blogged at great length about what I think are the strengths and weaknesses of Power BI (see here, here and here) so I won’t repeat myself here. As you would expect Microsoft marketing has gone into overdrive to promote it (have you entered the Power BI competition yet?) and it will be in 2014 that we see whether Power BI is a success or not. What will success look like though, if it comes? It won’t be lots of customers lining up to buy Power BI in they way they’ve bought traditional BI solutions, I think: instead it will be organisations that have already signed up for Office 365 being upsold to Power BI based on their existing commitment to the Office platform. This presents a number of challenges to someone like me who makes a living as an independent consultant and trainer. At the moment more than 90% of my consultancy income comes from SSAS and MDX, but the overall percentage of my time that I spend doing consultancy has reduced over the last few years to about 60%. This is partly the result of SSAS and MDX skills becoming more widespread; partly due to the fact that I’ve been promoting my public and private training more aggressively; and possibly due to fewer new SSAS projects kicking off. In the future I expect this trend to continue. Just how much consultancy will be necessary in the world of self-service Power BI solutions remains to be seen, but it’s going to be less than is necessary for corporate SSAS solutions and the rates will probably be lower too. For the same reason, though, the demand for all forms of training for Power BI will almost certainly be much greater. That’s why I’ve been scheduling more public training courses through Technitrain; why I’ve signed up to write a book on Power Query next year; and why I’ve started recording video training courses with Project Botticelli (there’s a new video available there, by the way, on set and member functions). If I’m honest I prefer doing consultancy to training and I don’t think you can be a really good trainer if you don’t have a substantial amount of practical experience gained from consultancy, so I’m going to have to make a special effort to maintain a balance between the two. Speaking at conferences and user groups is an aspect of my work that I’ve always really enjoyed, and I’m pleased to say that I’ll be speaking at the PASS BA Conference next year for example. I’m also still involved with SQLBits but please, please don’t ask me when the next SQLBits will be – we don’t have anything to announce yet but I can assure you we are working on it and I promise there will be one in 2014. I won’t be speaking at quite so many events as I have done in the past however. I travel a lot for work and this makes it hard to justify spending even more time away from my family, especially at weekends, so I’ve made a conscious decision to cut down on my speaking engagements. The thing is that the number of SQL Server events has increased a lot in the last couple of years and this has led to an increased number of invitations to speak, and I’m one of those people who finds it hard to say no when someone asks me to do something. I’m just going to have to be a bit more choosy from now on, and concentrate on events close to home, events that coincide with business trips and online sessions. 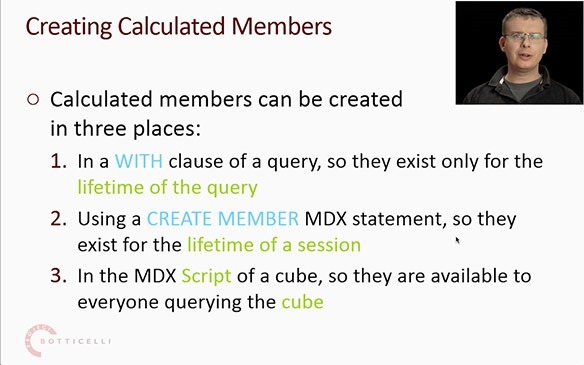 Last week I was doing some performance tuning on SSAS Multidimensional and saw something very strange: when the MDX Script of the cube was executed (as always happens after the cache has been cleared, or processing has taken place – you can monitor this via the Execute MDX Script Begin/End events in Profiler) the Calculate() statement was taking just over four seconds. I’d never seen this before so I asked the nice people on the SSAS dev team what was going on, and Akshai Mirchandani very kindly filled me in on the details. There are two types of calculation on an SSAS cube: those explicitly defined in the MDX Script (ie those seen on the Calculations tab of the cube editor); and semi-additive measures, unary operators and custom rollups, which are defined in the model itself. This second type of calculation is added to the cube when the Calculate() statement fires, and the more of them there are the longer it takes SSAS to work out where they should be applied in the space of the cube. In my customer’s case there were several large (80000+ members) parent/child hierarchies with unary operators as well as a few semi-additive measures and so this was the reason why Calculate() was so slow. Up to now I had only known that Calculate() triggers the aggregation of data up through the cube, which is why if you delete it the cube seems to contain no data. 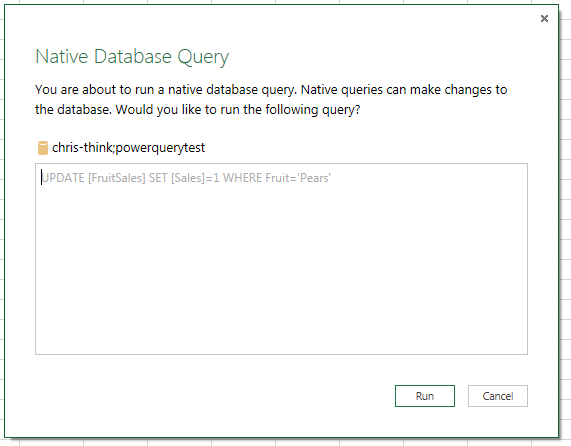 As of the November update of Power Query, it’s now possible to write your own SQL query when you’re moving data out of SQL Server into Excel using Power Query. So I got thinking… if you can write your own SQL query, can you execute any other SQL statement? 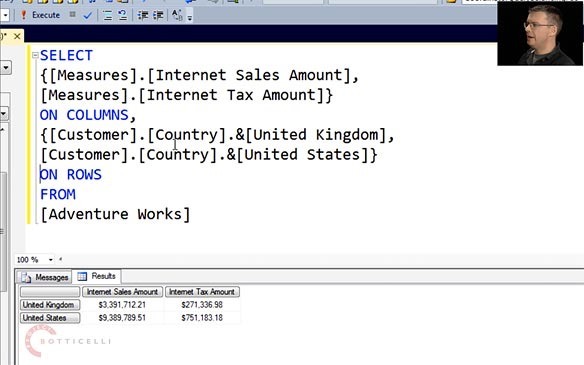 Can you use Power Query to move data out of Excel and into SQL Server? Well, it turns out you can… with some limitations. This blog post details what I found out while researching this problem. #"Expand Custom" = Table.ExpandTableColumn(InsertedCustom, "Custom"
Probably the safe thing to do here, I think. Furthermore, running a Profiler trace showed that each UPDATE statement was run at least twice. In fact, I originally started my tests with an INSERT INTO rather than an UPDATE, and found that since the INSERT INTO was run multiple times I ended up with duplicate rows in my table. None of the code I’ve showed here should be used in a real application of course, but with some thought (and maybe a few changes to the way Power Query behaves), in the future it might be possible to use Power Query to move data out of Excel as well as in. 11% of SSAS users are still using Proclarity as their front-end. That’s down from 22% two years ago, but still… I guess that the likes of Pyramid Analytics, which specialises in Proclarity migration, will be pleased to hear that. 29% of SSAS users are using Power View. That’s a big surprise for me – I haven’t seen it at any of my customers yet. Presumably this must be the Sharepoint version of Power View going against SSAS Tabular. I found the ‘cost per seat’ (calculated as license fees plus external implementation cost divided by number of deployed seats) table particularly interesting: SSAS comes out with a score of $1111, about a quarter of the way from the bottom; Qliktech comes in at $1499, Tableau at $1039. In general self-service BI tools don’t appear to cost any less to implement overall than traditional corporate BI tools. SSAS has a very respectable win-rate in competitive evaluations of 64%, although this is declining over time (it has to be said that almost all other large vendors are showing a decline too). Again, compare this with a win-rate of 34% for Tableau and 37% for Qliktech.